Be a statesman – There is a difference between being a politician and a statesman. In his classic work, “The Republic,” Plato was the first to identify the difference. Through the dialogue, he shares that statesmen are those who possess special knowledge of “how to rule justly and well” and have the best interests of the citizens at heart. Statesmen have a vision for the future as well as a moral compass that guides their decision-making. Statesmen also prefer to find the middle ground and are geared toward building solutions knowing that their decisions have to be sustainable. They play the political long game instead of taking short-term wins. Be a happy warrior – Politics is a rough sport. You get hate mail and now hate texts/emails. But, as William Wordsworth said in his poem on the subject: a happy warrior “plays, in the many games of life, that one where what he doth value must be won: whom neither shape or danger can dismay, nor thought of tender happiness betray… looks forward, persevering to the last.” Wordsworth and many psychologists suggest that the true pursuit of life isn’t happiness, but purpose. A happy warrior realizes that all great things come from chaos, taking the bad as lessons learned and cherishing the good moments. 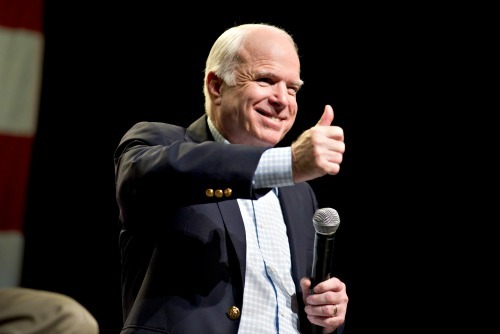 John McCain in life and now in death stands as a great example of a rare combination of statesman, happy warrior and public servant. I was honored to know him and experience his patriotism firsthand. I was a small cog in a very busy campaign, but every time we spoke or interacted I felt that he was listening, learning and appreciative of my effort. He knew where I grew up, my aspirations for the future and cheered me on – even after my service to him ended. I miss his presence in the political landscape immensely. There are many times since his death that I have missed hearing his perspective and words of wisdom to all of us as fellow countrymen. My wish as we enter a new political season is that all our elected officials learn through his example and practice daily being statesmen, happy warriors and public servants. I hope you enjoyed this blog, and would love to hear your thoughts about how we can use these lessons learned together in the social sector to guide our work.